The Northeast saw its warmest March in 118 years, beating out the previous warmest March (1945) by 0.9 degrees F. The region's monthly average temperature, 44.4 degrees F, was 9.8 degrees F above normal. March's average was only 1.9 degrees F cooler than April's normal average temperature and, with highs in the 80's as far north as Maine, some days felt quite summerlike! Between March 7th and 23rd, at least 127 new maximum temperature records were set at the thirty-five first order stations in the Northeast. 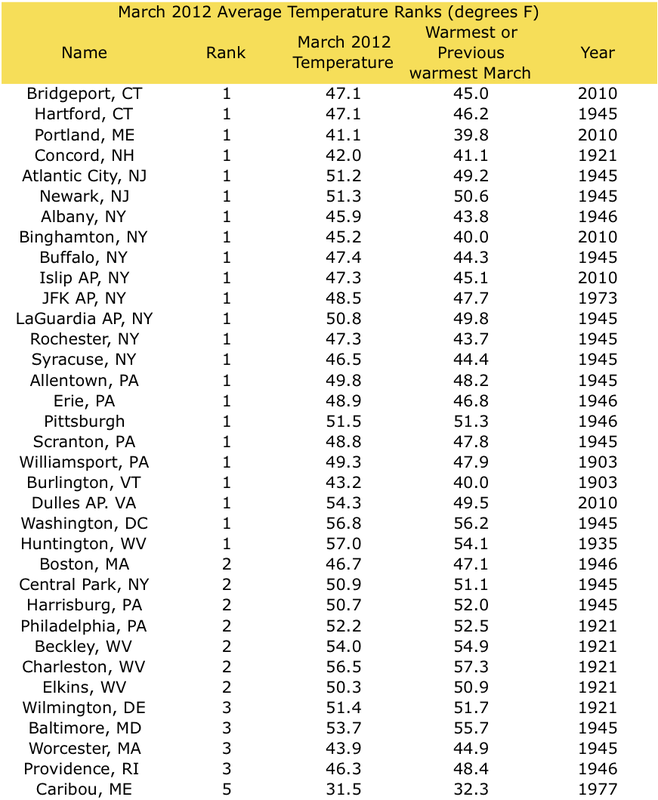 It was the warmest March at twenty-three of the Northeast's first order stations; averages at the remaining stations ranked them between the 2nd and 5th warmest on record. 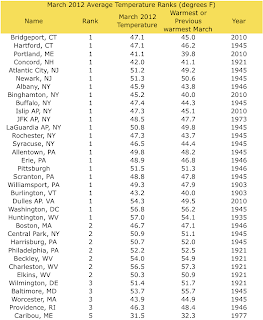 Of the twelve states in the region, seven had their warmest March since 1895 (CT, NJ, NY, PA, RI, VT, WV), three placed second warmest (DE, MA, NH), Maryland saw its third warmest, and Maine, its sixth warmest. Temperature departures ranged from +6.9 degrees F in Maine to +11.2 degrees F in New York. The string of above normal months stretched to twelve, and it was the 5th consecutive month with warmer than normal temperatures in all twelve states. 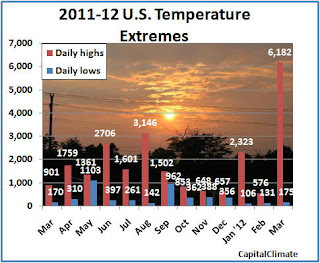 The average for the first three months of 2012 was 34.7 degrees F, which was 6.6 degrees F above normal. It was the Northeast's warmest January through March since 1895, beating the previous record year, 1998, by 1.4 degrees F. Ten of the twelve Northeast states had their warmest January through March since 1895. Maine and Maryland missed the top spot by 1.7 and 0.1 degrees F, respectively. 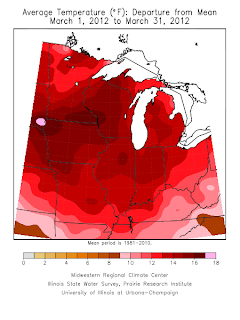 March was the warmest on record for the nine-state Midwest region, based on preliminary temperature data. The average temperature for the region was 50.3 degrees Fahrenheit, which breaks the previous record of 46.9 degrees set over 100 years ago in 1910 . . .
March average temperatures ranged from 10 degrees above average in Kentucky to 17 degrees above average in northwest Iowa, southern Minnesota, and western Wisconsin. During the record-breaking period from March 14 to 24, temperature departures ranged from at least 13 degrees above average in southwest Missouri to just over 29 degrees above average in central Wisconsin and northern Michigan. U.S. daily record high temperatures continued to surge into the end of March, with new heat records overwhelming cold records by the incredible ratio of 35.3 to 1. 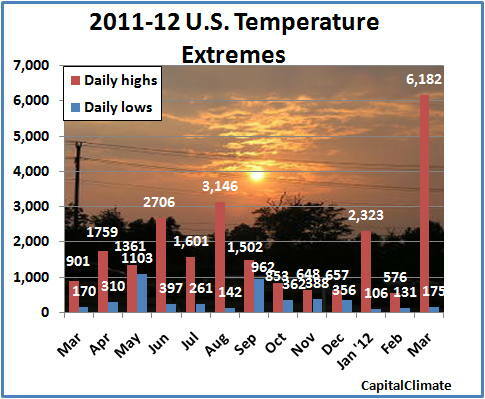 The total number of heat records was 6,182, nearly double the number in the sweltering month of August last year. The monthly count for March was also more than the entire year's total of cold records in either 2011 or 2010. The year-to-date ratio is now at 22 to 1, nearly double last summer's pace. Included in the total were 340 new all-time March high temperature records vs. only 8 low temperature records, a ratio of over 42 to 1. Over 110 official climate reporting locations (ASOS stations) in 27 states also reported record high average temperatures for March. This represents roughly one-fourth of the total number of such stations. Update 7: Added North Dakota, South Dakota, more Kansas and Nebraska stations. Update 8: Added Oklahoma, Montana, Wyoming, Colorado. Update 14: Added Atlanta region. The extremely warm temperatures this past month set records for warmest March average temperature in at least 110 cities across 33 states from New England to Montana (including the 4 major cities highlighted previously). In addition to the Washington, Albany, Chicago, and Minneapolis records shown in the previous post, the following major climate reporting locations set records, in many cases by wide margins in century-plus periods of record (previous records and year in parentheses). Locations are grouped by state, roughly north to south, and east to west. 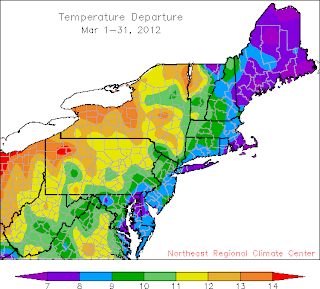 - Burlington: The 12.2° departure above normal was the third highest for any month since records began in 1884. - Indianapolis: The last time any new monthly record average temperature record was set was in August 1936; the current record breaks the old March record by the incredible amount of over 4°. - South Bend: The March average was 4.1° above the normal for April. - Ft. Wayne: The high of 87° was a new all-time high for the month of March (old record 86° on the 24th in 1910). - Chicago: The March average would have been the 7th warmest April. - Rockford: The March average would have been only the 3rd coolest May. - Milwaukee and Madison: Both also set records for warmest first quarter (January-March), 36.2° vs. 33.2°/1921 and 35.2° vs. 33.8°/1878, respectively. - Des Moines: The first quarter (January-March) set a new record of 39.7° vs. 36.1° in 1921. This was the first winter in which the low temperature failed to reach zero. 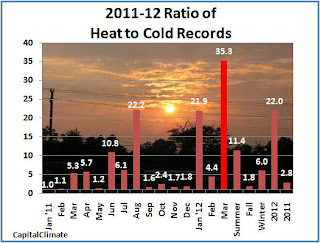 The 12 months from April 2011 through 2012 averaged 55.1°, breaking the old record of 53.6° in 1934-35. Records began in 1879. - Waterloo: This is the widest margin between any monthly record and the second place temperature, ahead of November 2001, which was the warmest by 4.2°. The first quarter temperature of 34.8° breaks the record of 32.7° set in 1921. Records began in 1895. - Fargo: The minimum of 60° on the 18th was an all-time record high minimum for March. - Glasgow: This was the 9th month in a row with above-normal temperatures, and the average of 44.1° for July 2011-March 2012 is the warmest on record; the previous high was 44.0 in 1991-92.